Big Brother stars Jessica Graf and Cody Nickson have taken their “showmance” to the next level! The couple, who met on last summer’s ‘Big Brother 19,’ got married on Sunday at Saddleback Ranch in Malibu, California. 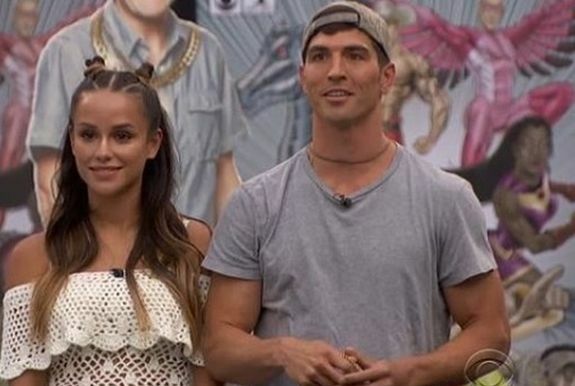 People magazine reports that Jessica and Cody exchanged “I do’s” in front of about 100 guests, including their ‘BB19’ co-stars Mark Jensen and Elena Davies. The couple– who got engaged in February— announced last month that they are expecting their first child. Jessica (and her baby bump) wore a silk gown with a long train. (Thankfully, she did not wear her ‘Big Brother’ signature cat ears to the wedding.) As for Cody, he chose to wear a tuxedo…and cowboy boots. “I know that’s very untraditional, but I like the picturesque feel of it all,” Jessica said of the black attire. I just want to tan + laugh. “He sang it to me when we were in the ‘Big Brother’ house, and we danced to it, and, it just always sat in the back of my mind as one of our special moments,” Jessica told People. Jessica and Cody treated their guests to a donut wall, late-night pizza and a four-foot wedding cake. I love you more than life itself. Plain and simple bubs ❤️ Semper ? Jessica told the magazine that they are planning on having a big family. Congratulations to the happy couple. I’m sure you’ll still be beautiful no matter how many babies you end up having, Jessica!! I give it a year.. ?